What is the role of the office of the Deacon according to the Bible? Do they play a role in local church government? 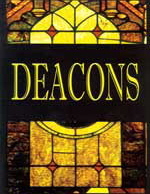 The Bible does describe what a deacon is and gives us examples of deacons as well. Therefore, God gave us what we needed to be able to distinguish the role of the deacon without need for confusion, assumption, or over-extending the role of the deacon in the local church. We understand that Jesus has called all Christians to be servants. He gave us example by getting on His knees and washing His disciple’s feet. Then He said that we ought to wash one another’s feet. This represented Jesus, Lord of all, coming down to earth to be a man and serve us by washing us from sin. So Jesus teaches all His disciples need to serve one another. So whether someone is an Apostle, Prophet, Evangelist, Pastor, Teacher, Deacon, or holds no office in the Body of Christ, they are to “deek” – to serve. That is the general definition of the word deacon but the Bible also has an office of Deacon for the local church with specific functions. What we tend to do is apply a general meaning to something specific and a specific meaning to something general and get things all mixed up. For example, we generally agree that the Pastor is a servant or minister, which is right. But some wrongly say that the Pastor then is equal in authority and power to a Deacon in the local church because, “Hey, don’t they all just serve or minister?”. No. Just because the word “deacon” means minister, that does not redefine a very specific office of Pastor to being equal to a very specific office of Deacon. Each office has certain roles and responsibilities that the other does not hold. This does not mean one is of greater value than another. However, the Kingdom of God operates in a system of order. That order dictates some to lead and others to follow just like in a government or military (Exo 18:21-25; Deut 1:15; Num 31:14; 1 Sam 8:12), otherwise everyone would do what was good in their own site and there would be chaos. 1Ti 3:8-13 Likewise must the deacons be grave, not doubletongued, not given to much wine, not greedy of filthy lucre; (9) Holding the mystery of the faith in a pure conscience. (10) And let these also first be proved; then let them use the office of a deacon, being found blameless. (11) Even so must their wives be grave, not slanderers, sober, faithful in all things. (12) Let the deacons be the husbands of one wife, ruling their children and their own houses well. (13) For they that have used the office of a deacon well purchase to themselves a good degree, and great boldness in the faith which is in Christ Jesus. Paul writing to Timothy, a young overseeing Pastor, spoke of the two offices that are required to run a local church in 1 Timothy 3: The Bishop, or Pastor, and the Deacon. These are the two and the only two offices ever mentioned as being needed to run a local church. All that are serving in the local church fall under one of these two categories; they are either the Pastor or they serve as a Deacon in a helps (1 Cor 12:28) capacity. There are other offices that serve the Body of Christ like the Apostles, Prophets, and Evangelists (Eph 4:11). However, the Pastor and Deacon are the offices that keep the local church functioning. Since Deacons have a place of open leadership by way of their service to the local church, they need to be an example, really the example, of how to live a Christian life for those who are not called to ministry. Many times people think, “Well the Pastor is supposed to live godly and holy but the rest of us don’t have to go that far.” No, the office of the Deacon proves even the laity (those not called to full-time ministry by God) are to live godly and holy at all times. The Deacon is a laity position and they are to serve in the local church having their own lives in order as well as the lives of those in their household. Act 6:1-7 And in those days, when the number of the disciples was multiplied, there arose a murmuring of the Grecians against the Hebrews, because their widows were neglected in the daily ministration. (2) Then the twelve called the multitude of the disciples unto them, and said, It is not reason that we should leave the word of God, and serve tables. (3) Wherefore, brethren, look ye out among you seven men of honest report, full of the Holy Ghost and wisdom, whom we may appoint over this business. (4) But we will give ourselves continually to prayer, and to the ministry of the word. (5) And the saying pleased the whole multitude: and they chose Stephen, a man full of faith and of the Holy Ghost, and Philip, and Prochorus, and Nicanor, and Timon, and Parmenas, and Nicolas a proselyte of Antioch: (6) Whom they set before the apostles: and when they had prayed, they laid their hands on them. (7) And the word of God increased; and the number of the disciples multiplied in Jerusalem greatly; and a great company of the priests were obedient to the faith. This tells us a great deal about the function of the Deacon. They are to serve tables meaning they are the manual labor side of the local church. They help keep the church running by working in the natural work of the local church allowing the Pastor to focus on the spiritual work but, of course, all work is both spiritual and natural to some degree. Deacons are not in full-time ministry therefore they cannot hold the office of the Pastor/Bishop/Elder. Nor can the Pastor hold the office of the Deacon. Before he goes into full-time ministry, every Pastor should go through the office of Deacon to understand the workings of the local church. Philip was a Deacon in a local church before he became an Evangelist (Acts 6:5; 21:8). So the office of Deacon can be a training ground for full-time ministry. However, the Deacon is not to be involved in any church decisions regarding the governing of the local church. Nowhere in the Bible are they shown to make any leadership decisions determining the direction of the church. It is very clear they are ones that “serve tables”; i.e., they are the workers, not the overseers of a local church. The words “Pastor”, “Bishop” and “Elder” all have overseeing meanings; the word “Deacon” has a meaning to serve. Church after church has been destroyed allowing Deacons to make leadership decisions for a church. According to the Bible only the Pastor is called by God to lead the local church. In the United States you will need a board and it is fine to have Deacons sit on the board just as a pretense to comply with the laws of the land. However, the Deacon has zero business in church decisions according to God’s Word. Deacons should follow the leadership of the Pastor and if they do not like his decisions, as with anyone in the church, they can simply leave. Today, people think democratically and logically instead of biblically. We think, “more heads are better than one to make decisions.” Actually, more heads are better than one to tackle problems and come up with ideas. But when it comes time for the decision, God’s Word reserves that to only person – the Pastor. There should be no voting for church decisions. Deacons should meet with the Pastor to come up with solutions to problems and ideas for the church but the buck has to stop with the Pastor. This allows him to override the logic and reasoning of the group to hear from God and do what He says in case it is different from man’s logic….and it often is. Some decisions God leaves to us but others He doesn’t. But either way, if the Pastor is not given full freedom to be the sole decision-maker, the only thing that will result is division, confusion, and strife. More importantly, what will result will be a church outside of the guidelines of God’s Word which is inherently a failure prohibiting the full spread of the Gospel. Some may say that the Pastor is given to the Word and prayer so all natural thing concerning the local church, namely all decision-making, should be left to a group of Deacons. This objection is so backward it is hard to even know where to begin to answer this. Nevertheless, as I have already stated and proven in the previous parts of these articles, God gave the Pastor the only overseeing role of the local church according to the Bible (and I know many people will not let the Bible get in the way of what they believe; church tradition is lord over most churches.) This objection is misdirection. The question is not whether the Pastor can or cannot govern the church all alone because obviously he cannot do it alone. He needs the help of those subordinates he chooses to help him in the work. He simply is the one at the top overseeing the church. By the way, when the church designated deacons to serve tables, they were still under the authority of those Elders that appointed them. Also, these very Deacons, Stephen and Philip, were still out evangelizing. So the argument that if you are doing spiritual things, like preaching, you will not have time to do natural things like serving tables is not true. But that is not how it is done today. Those people supposedly called to “serve in natural things” (today’s Lay-elders and Deacons) have taken to themselves much more authority than they were granted by God when they try to run the church. It is also a fallacy to say the running of the church is somehow only physical or natural. The running of the church is, from beginning to end, every single ounce of it, a spiritual work. It takes faith to believe God for the finances to pay the bills, to build the buildings, to maintain the building, to have programs, and to do any other activity associated with church. The spiritual is first, and foremost, and out of the spiritual come the natural finances, resources, and activities. The spiritual is the root and the natural become the visible fruit. So to try to separate these so one can say that the Pastor cannot govern natural affairs as well as spiritual is idiocy. For his church, he is the only one that can because he was given the anointing by God to do so, to see the big picture of natural and spiritual to oversee and govern. If you are in a church overseen by anyone other than a single Pastor, you need to get out. These churches are controlled by democratic popularity contests and/or certain entrenched families usually having money or a high reputation in the community. This is not God’s design for the local church which is why so very few are being effective for the Kingdom. Democracy is man’s idea, not God’s. God’s Kingdom is a Theocracy – ruled by the Lord Jesus Christ and under Him He appoints a single leader to oversee a local church. If that leader gets off course, people can leave. However, the fear of Pastoral abuse of his authority is no reason for a group of laymen to take control of a local church outside of God’s prescribed church government in the Bible.